A retired university professor is diagnosed with a rare degenerative disease that will lead him to lose his memory and die within a few years. On his way home from the doctor's office, he witnesses a pretty young girl being kidnapped right off the street. As the police drag their heels, he realizes that if he doesn't act the girl may never be found alive. Jennifer Riggins, the kidnapped girl, is being held prisoner by a perverted couple who run an exclusive Web site called "What Comes Next," on which viewers can watch, in real time, the horrors inflicted on their victims. Given the moniker "Number Four," Jennifer is at the mercy of the depraved pair, with thousands tuning in for every episode of her ongoing nightmare. 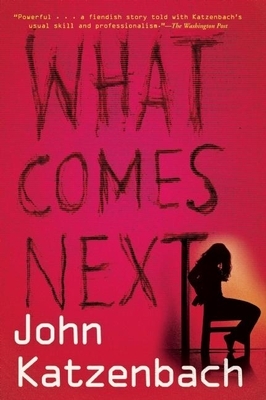 What Comes Next is a bold and timely thriller about what lurks within the depths of society's most depraved minds, and how the only hope for a girl whose life is just beginning is a man whose life is nearing its end. John Katzenbach has written ten previous novels and one work of non-fiction. Three of his novels have been made into feature films: In the Heat of the Summer (adapted for the screen as The Mean Season), Hart's War starring Bruce Willis, and Just Cause starring Sean Connery. His other books include the New York Times bestseller The Traveler; Day of Reckoning and The Shadow Man. Katzenbach was a criminal court reporter for The Miami Herald and Miami News and a featured writer for the Herald's Tropic magazine. He lives in western Massachusetts.